Only a few generations of humans have had instantaneous electronic communications, and only now are we launching groups linked with the historically unique cognitive (digital) technology of computers. Humanity has progressed by substituting brain for brawn. We see the rise of smarter groups as new forms of human networks intertwine with the electronic world of technology networks. In the Industrial Era, organizations are likened to machines. In the Information Age, both organization and computer networks feed off the same metaphor, the human brain/mind. Where once the extension of limbs and senses occupied center stage in the human development of tools, today digital technology amplifies gray matter. The most distinctive feature of networks and virtual teams is the abundance and variety of links—of media, interactions, and relationships. For the initial analog phase of computer development, physical brain analogies between corporate networks and human nervous systems are apt. As we rocket into web worlds interrelated through hypertext links, mind metaphors are coming to dominate descriptions of virtual organizations. The characteristics of these emerging models reach back to roots in traditional hierarchy and bureaucracy as well as cast forward to the new capabilities in networks. On the web, people express links and relationships in context. On intranets, extranets, and the Internet, a dynamic distributed human intelligence comes together and grows with the group. With hypertext links, the team’s ability to create and use shared cognitive models crosses a fundamental threshold. The nature of the online space is no longer primarily an artifact of the hardware/software structure of the technology. It is a matter of choice, the human intellect creating a shared mental space. Portents of the vast change to come develop slowly and virtually imperceptibly through the next 100 years as Boole's engineering descendents, notably Charles Babbage and Ada Lovelace, create a mechanical means of configuring binary logic into a human cognitive helpmate. However, not until ENIAC is built in the mid-1940s does Boolean processing reach electronic speed and pure digital form. In 1962, after ARPA recruits Licklider, he personally connects the leading computer scientists of the day in the major research universities and a few companies. This human network is the embryonic beginning of the collaboration need that in time stimulates development of the ARPAnet forerunner to the Internet. He calls this group the “Intergalactic Computer Network,” by which he comes to mean “not just a group of people to whom he is sending memos but a universe of interconnected computers over which all might send their memos.”3 In Licklider's mind, networks of people and computers conjoin. From the beginning, Engelbart emphasizes the complementary nature of the “man-artifact” interface, the need to co-evolve the human system (that includes elements like methods, skills, knowledge, language, training, and organization) along with the technology system. When the history of group intelligence is written, Murray Turoff's name is also likely to be on the list of major contributors. Turoff creates what is probably the first large-scale conferencing system in 1970 at the Office of Emergency Preparedness in the Executive Office of the President. He then designs and implements, initially under National Science Foundation funding, the Electronic Information Exchange System (EIES), which continues today as the grandparent of online discussion platforms. Is it possible to conceive of a collective intelligence capability for a group of humans? Is it possible for a group of humans utilizing an appropriate communication structure to exhibit a collective decision capability at least as good as or better than any single member of the group? When we say, “That's a smart move,” referring to a company or group announcement, we show respect for the organization's thinking. Is there always a single smart person doing the thinking for every smart move by a group? Or, are our metaphors of “brilliant” or “dumb” groups clues to a “hidden reality” of group cognition? There is something more to the thinking of groups than is found in the thinking of individuals in the group. That something more is different from, not better than, personal thinking. Moreover, this reality is not hidden. Rather it is very open, beneath our collective noses, awaiting only a shift in perspective to see the cognitive richness of our everyday lives. The payoff for seeing how groups think is great: Smarter groups. But we don’t have to wait for tomorrow for smarter groups. Most people have at one time or another been a member of a group that really “clicks”—a family, work, political, religious, or volunteer effort. Most people intuitively know the tremendous personal satisfaction that is possible with high group performance. Only a small general improvement in people’s ability to think and act collectively will have a great impact on solving the world’s problems, large and small. As the planet rapidly interconnects, sheer complexity puts an understanding of the whole beyond the reach of a single individual. Collective problems require collective solutions. Where success is a matter of agreement, like a negotiation, rather than finding a correct answer, like a spelling bee, it is the intelligence of the group that counts. No single person is going to solve the problem of population, or address environmental, viral, economic, genetic, or other really big issues that loom over the 21st century. They only can be tackled through collaborative action. If we do not understand how our groups think—or even that they do think—then we will be unable to meet the challenges of our rapidly changing world. We need smarter, self-organizing groups to cope with complexity and claim our possibilities. To help get there, we begin with an abstract idea of how groups think, and end with how to integrate cognitive capabilities into our four-wall virtual team room. As individuals and as groups, we use models to understand the world. When data pours in, we sift it and sort it—by categories. We develop cognitive models from the pattern of relationships between categories. Thinking begins not with any old kind of category, but with a specific kind of category, what are called “basic-level” categories in cognitive science. Basic-level categories are simple ideas that everyone directly understands: Cars, homes, jobs, and families. On the range of concepts from very general to very specific, people seem to understand ideas in the middle. This is called the basic level, not meaning the lowest level, as the word “basic” might suggest, but the most common, most widely understood middle level. According to research, people grasp the idea of a “dog” (an intermediate concept) more directly and easily than an “animal” (a more general idea) or a “Golden Retriever” (a more specific concept). People categorize from the most accessible part of their experiences. Categories begin in the middle. This basic level anchors our gestalt sense of whole things and allows us to extend concepts “up” to more general levels and “down” to more particular levels. Chairs are a basic level category; furniture is more general (up, super-ordinate) than chairs, while rockers are more specific (down, sub-ordinate). Groups also categorize from the middle. For example, a planning group tries to define yearly goals at the appropriate level of generality—where the idea is easy to grasp and easy to sell. Basic-level goals then anchor very specific (sub-ordinate) tasks that spell out how to achieve the goals. Looking up, the goals relate to broad (super-ordinate) organizational strategies, mission, and vision. From basic categories, we move to add the idea of basic patterns. Patterns are the configuration of connections among categories. The container is perhaps the most basic pattern of our daily experience. We are ourselves containers. Our bodies are, quite literally, vessels. Things go in and out of ourselves. Our physical body is a container—like a can, cup, or box. We are also contained. With our bodies, we constantly move in and out of other containers—like rooms, houses, and cars. Our everyday human experience as both containers and contained gives us a typical way to think about containers in general, an abstract schema. The container pattern consists of just three elements: inside, outside, and boundary. 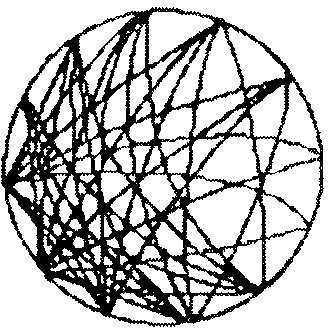 Schematically, it looks like a circle with a point of reference inside or outside. We use the container schema all the time, as we move through the concrete and abstract categories of life. Imagine the typical morning of Rebecca Stillwater, who lives in the Boston suburbs and works in the city. She goes out of her house, enters her garage and gets into her car. She pulls out of the garage and the driveway, eases into a flow of traffic and drives into the city. She pulls into her parking space, gets out of her car, and goes into her building. She shows her badge and signs in. When Rebecca “signs in,” she enters a very different kind of container than her home or car, but it is no less real. She enters an organization—a social structure, with an abstract inside, an outside, and a boundary. Her badge shows she belongs inside the social box. Containers represent a level of human experience common to everyone. This pattern allows us to build mental bridges from physical activities to abstract ones. We metaphorically extend physical vessels, for example, to social ones via the container pattern. Containers help us structure our daily life. They also provide structure for some of our most sophisticated philosophical ideas, including the idea of categories itself. Categories are containers: They hold related instances. Whole-part is another basic pattern, which inherently structures the whole-part principle. It provides one of the principal means to extend categories, the use of one part or member to stand for the whole, called metonymy (the categorical representation of leadership). And, just as the container schema underlies the concept of system, the whole-part schema underlies the systems idea of “hierarchy,” the sets-within-sets structure of complexity. In this view of human thought, cognitive models tie categories and patterns together. A cognitive model is a system of categories related through recurring patterns. Containers and whole-parts are common to both personal and group cognitive models. All cognitive models represent information by chunking experience into labeled containers, or categories. And all models have at least three levels of structure: the model as a whole, its categories (parts), and the content items populating the categories. While categories may differ, both groups and individuals connect categories in similar ways. The notion of category itself reflects these two aspects of cognitive models, the common framework and the differences of content. For while the content of a category varies, the container structure of the category does not. Categories are simply containers. Categories are vessels that can hold an infinite array of ideas and experience. An organization chart represents a group cognitive model, a system of linked categories (work groups) structured by the whole-part pattern, which gives meaning to the enterprise as a whole. A group also has other cognitive models, such as those based on purpose, plans, and conversations. Picture an organization chart. What the chart represents is a default view of how the group sees itself: Its categories of roles, job descriptions, and titles. A complex group forms and names sub-groups, divisions, departments, and task teams. Each box is a category that shows a part of how the group divides up its inner world. Both people and sub-groups of people represent categories in the membership model of a group. A vice-president of marketing is a role category that is “filled” by a person. A marketing department identifies a major sub-group category; it denotes a specific function within a larger architecture of functions that together constitute the whole organization. The title, VP of Marketing, for example, is meaningless by itself; it acquires meaning as a node in a network of groups and titles that together constitute the configuration of an organized whole. Reporting categories invariably connect through whole-part, hierarchical relationships, and comprise a cognitive model. How is the configuration of sub-groups and roles a default model for a group? Consider how we individually process incoming information, a basic function of our personal thinking apparatus. When a group receives information, say an e-mail or letter with a request, it is routed to the most relevant person (role) or sub-group for assessment, or meaning. The group's cognitive model functions effectively when people in a group easily and quickly pass information, problems, and possibilities along to “the right place.” If, however, new information arrives and no one knows what to do with it, the shared cognitive model does not function well. Because there are no established roles or sub-groups to handle the input, the group experiences frustration. An organization chart is a literal picture of a group's membership model. Each box in the chart is a category, a container representing specific responsibilities and information. These boxes are connected by whole-part relations often shown in a tree configuration, a single cognitive model. The importance of how a group chooses to divide itself up, to create its cognitive model, becomes apparent when a group consciously goes about changing this model. Reorganization, a frequent activity in rapidly changing environments, is a collective cognitive process. When a group reorganizes, it usually does so to improve performance, to be more effective, to be, in a word, smarter. How a group differentiates itself, how it names its parts, is a critical determinant of how smart it will be. During reorganization, a group creates new categories, new organizational positions and sub-groups (perhaps hiring people), deletes some existing categories, abolishes some sub-groups (perhaps laying people off), and rearranges existing relationships (like changing reporting structures). At the end, there is a new cognitive model, represented by a new organization chart. So where do human categories come from? As Homo sapiens, all people share fundamental similarities, a common pool of categories connected to activities like eating, drinking, and sleeping. The most basic and common categories emerge from our earliest childhood experiences, and they transcend cultural differences. Basic categories are surrounded by a vast penumbra of other categories that spring from differing environments and histories. If individual human thought is based on the human body, then what is the thought of a group based upon? Group thought is based on group realities. Communication that is external to individuals is internal to groups. The stuff of group cognition is what people say, write, and do, particularly communication that lasts. Memories with emotional impact, written words, rules agreed to, and symbols rallied around carry the traces of people's interaction with one another and part of what it means for a group to be embodied—to have concrete experience. Group entities are concretely real. Not concrete like individuals, but concrete like groups. While human bodies are distinctly singular and centralized in nature, group bodies are essentially multiple and distributed. Immense variations in size, longevity, and purpose suggest that group categories are different from individual categories, and that the range of differences among groups is much greater and content is much less common than it is among individuals. The distributed nature of groups makes them difficult to see from a single perspective. For our “conceptual lens”, we use four views, each representing a different dimension of group reality, a different facet of the “quality without a name” of a living group. Typically, we “see” groups through the people dimension because human groups are quite obviously made up of people. Commonsense tells us to know a group through the people that make it up, its members. Thus, the group includes (the two or more) people that comprise the group. Since this dimension is more generally about the nodes that comprise the network, it also includes things that a group owns or uses. Property, resources, and technologies are very material, very concrete, parts of group reality, particularly for long-lasting and/or large groups. Groups have purposes. People group for a reason. It takes work to form and maintain a group. Purposes may be implicit, such as those of friendship networks, or explicit, such as those expressed in company charters and annual plans. In teams, purpose and the achievement of goals motivate the group. Without its tasks, a work group has no coherence, no integral reason for being. For every human organization, large and small, there is a pattern of activities, reflecting its certain set of purposes. Groups exist in time. They are organic human entities that reflect change and adaptation over time. Groups also have life cycles, whether very short over a few hours or days, to months, years, centuries, and, in the case of some religious organizations, millennia. Calendars, agendas, schedules, and milestones provide various ways in which groups develop time-oriented cognitive models. People, purpose, links, time—four dimensions of group reality. While these certainly are not the only ways to see groups, they are basic and broad enough to shed insight into how groups think. “Computers are to mind what machines are to muscle.” As the cliché reflects, computers are natural cognitive media. It is not surprising, then, to find the same general cognitive patterns infused throughout the hardware and software interfaces that people use on a daily basis. Most cognitive scientists believe we think by using language. Many believe we also use images to think, and some believe in even more forms of cognitive representation. On the face of it, the online contents of e-mail and threaded discussions are sets of natural language statements, a list of propositions—public mental representations. While text predominated online for decades, the newer technologies and economics of imagery on the web make all forms of expression, including audio and video, common to the group memory in the new millennium. Categories, levels, and networks infuse the online environment. The online database memory has a thoroughly hierarchical architecture. Online communities create mailing lists, conferences, meetings, topics, and the like, intermediate group structures. These groups have an autonomous online life, yet are interconnected as a network whole. Static databases, too, have their own integrity and special purpose, and yet are often linked together in networks. Most significantly, the physical substrate of online groups is a computer network, itself built upon a telecommunications network. An online group memory that includes “live” participants has recall ability not available to individual thinking entities: The ability to ask questions. Asking and answering are the essence of human networking. As in personal memory, where recollection can prompt a chain of thoughts leading to insight, so asking a question online may prompt a series of responses that take all participants beyond the understanding they started with. More generally, conversations that flow in digital space are naturally captured and capable of recall, summarization, categorization, and connection. A virtual room, a cyber place, is a team’s basic container. A place to be enables a vital human system to develop, which in turn configures and transforms the place that it lives in. An application’s user interface is software that helps people leverage computing power. The interface usually draws from the craft of the capability being enhanced: Spreadsheets are natural to accountants, documents to writers, and graphics to artists. Most software assumes an individual is the user, but in the networked world, teams are also users of software: E-mail is meaningless if only one person has it. How can we devise a team interface in digital technology? By creating and using shared cognitive models in an online place, a room where people generate their own customized “Group GUI” (Graphical User Interface). People filter incoming information through cognitive models, recall old memories through models, and create new models to predict the future. So do teams. They can explicitly create and manipulate these models in a computer-mediated environment. For the globally distributed groups made possible by technology, there is an especially urgent need for visible, explicit, shared models to give meaning to the online world. Behind the four-wall virtual team room is an interactive environment that naturally enhances the team’s intelligence. People are able to use the tools and displays of their shared information in practical but intelligent ways without regard for the abstract underpinnings. Cognitive capabilities lie deep in the conceptual architecture of the room and its technological substrate, an invisible electronic infrastructure that supports human relationships. The virtual team room Portal page provides entree to a place that holds the identity of a virtual group. This expresses both the basic container pattern and the central idea of hierarchy, a point of reference. The virtual team and its portal page are the locus for a mission and the focus of internal leadership. The portal also identifies the top level for planning and managing a task-based project. In the language of the Internet, the portal represents the home page of the team web site. It bespeaks the central focus of the team, and offers selected links to the things most relevant to that focus. Also associated with setting up a new group home is a new database for the group's growing profile, plan, and process information. Organizations and individuals are themselves complex containers. Underlying the freewheeling ad hoc ability to profile members and construct groups on the People Wall is the immensely powerful whole-part functionality of a hierarchical tool. With the extended organization chart, you can see up and down the levels of the organization from a given point of reference. This capability underlies the team's ability to differentiate itself as its purpose unfolds. As a team works, it subdivides and reorganizes itself to best fit the configuration of tasks. An even moderately complex team will soon form sub-teams, a natural step that is all too often taken unconsciously, with little thought and allowance for the review and feedback process required to get any set of basic categories right. Hierarchical clustering infuses throughout the architecture of any web site and of course any online room. Navigation schemes set the handful of high-level categories that best span the range of information contained in the site. These “getting-around” schemes typically are available in frames at the top and/or sides of web pages, and clicks on a major head often reveal a subhead level of outline detail. The “team table” also has center-periphery pattern features. Core, extended, and external team members are arrayed in three rings of involvement. The central membership of the team exists in the penumbra of people participating less intensely. The Purpose Wall contains the “goal-path-result,”10 the pursuit of objectives through time. This design is the same as the “input-throughput-output” model that we use to organize the taxonomy of virtual team elements (Figure 12.1). It is the simple human idea of starting somewhere with an idea, an intent, and proceeding through a series of steps to reach some end—a goal, outcome, or result. The very human process of aligning around vision and goals can be messy, particularly for virtual teams. The map of organizational purposes [Figure 7.4] provides a common framework for constructive conversations on collaboration. The project management system and the electronics behind the Purpose Wall supports planning and tracking goals, tasks, meetings, decisions and concrete outcomes. Links, the mental construction tool for the ephemeral fabric of the Links Wall, represent a very basic pattern, the connection of point A to point B. The essential meaning of the web is “to link.” Links provide the extraordinary ability to move instantly from anywhere to anywhere on the planet—both literally and figuratively. Links connect us to others in networks, and links connect technologies together as networks. Different media offer people pathways with different connecting characteristics. Depending on the medium, different senses and brain structures engage, which translates to a need to employ multiple media to fully enable group cognition. Patterns of enablement, removal of restraint, compulsion, diversion, counterforce, attraction, and blockage bespeak the range of relationship configurations people use to shape their social world.11 These rule-driven processes are at the heart of replicable workflow models that use technology to move work from person to person. By linking categories together into cognitive models, a team creates its mental reality. While individual relationships are the spice of our moment-by-moment experience, it is the pattern of relationships that creates a social whole over time. Since digital reality ultimately expresses itself as data, we stand on the threshold of a new era of social self-knowledge. More and more of group life will occur online and be captured in a data model underlying its team room. There, at the data level, the basis for true social science emerges. The fundamental problem with the human sciences is often characterized by analogy with the “Heisenberg Uncertainty Principle.” At the level of quanta in physics, the interference of observers dependent on light or other electromagnetic means to “see” sub-atomic phenomena means they can know a particle's whereabouts or its speed, but not both at the same time. What is applicable in the physical domain of quantum mechanics far from the levels of sensible experience is an in-your-face limitation on the human sciences. You cannot bring natural groups into a lab, and scientist-observers always affect the behavior of people in a group being observed. But when a group naturally gathers data on itself online, it creates the potential to learn through feedback loops. How are we doing against our plan, what tools do we use to address conflicts, how long does it take to reach decisions using different media, what's the inflow and outflow of members? Answers to myriad questions like these gradually will build a base for collective self-knowledge. Popping up a level, we see knowledge harvested across many teams that are learning from their own processes. Many teams within a common culture, such as a global enterprise, as well as many teams coming from many cultures, will provide a vast new scientific territory to explore and mine for deep knowledge as well as immediate application. Because this new scientific goldmine is embedded in the practical everyday use of collaboration technology, knowledge gleaned from this environment is highly likely to be relevant to boosting the performance of digitally endowed human entities. Our vision is of an emergent level of group thinking that in turn stimulates the evolution of individual human consciousness. Do groups think? Can we imagine they do and make it real by creating thinking groups? These are big questions to hold in our individually small hands. See the Bootstrap Institute at http://www.bootstrap.org.